The other night, Andrew and I were feeling too lazy/starving to buy ingredients to prepare our own dinner, so we decided to hit up the Venice Whole Foods already-cooked-meal section. I hadn't been there since becoming a veghan, but I wasn't worried about it. Whole Foods is known for catering to yuppie feeding trends (like being allergic to gluten or having a thing against pasteurization). As expected, there were nearly as many vegan options as non-vegan options. They had a Vegan Taqueria right next to their plain old Taqueria and a whole corner called Venice Raw Foods (though not all those raw foods were vegan). But I was most intrigued by the pho bar. 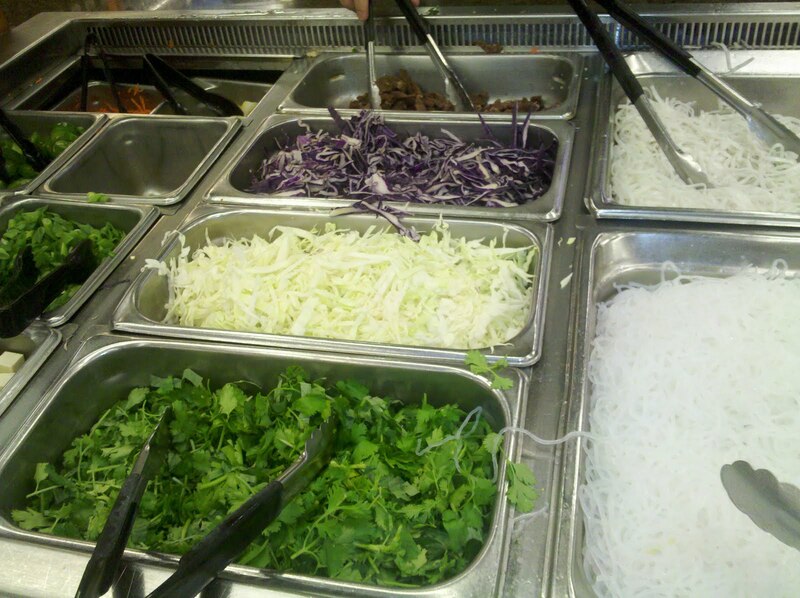 Pho is a Vietnamese dish including noodles, broth, and vegetables. The reason I was excited about the pho bar is not because I love pho - in fact, I had never tried it before - but because I love food experiences in which I can put together all the ingredients of my own meal. It helps if the ingredients are already cooked (I struggle with Korean barbeque) and laid out in an appealing way so I can choose what looks tastiest. I called over my shoulder to Andrew, "I'm going to try some pho!" I pronounced it "foe," as in someone who is your arch nemesis. Andrew is one of those people who always know how to pronounce foreign words. He scrunched up his whole face like he didn't understand what I was talking about, even though I was walking toward the pho, pointing at the pho - I was practically already preparing my pho to eat. "Oh, you mean pho?" He asked, pronouncing it "fuh," as in the first sound of the word "funky." Obviously that was what I meant. What the pho, Andrew. The Venice Whole Foods Pho bar had everything I was looking for: vegan broth in a pot right next to the beef broth, tofu right next to the beef, and tons of veggies. I am generally pretty nervous about trying new foods from countries where the people like hot, spicy things because my body has a zero tolerance policy when it comes to spice. If my food has even been in the same room as cayenne pepper... pho-get about it. But I figured if I avoided the hot peppers and stuck to mild vegetables, I'd be okay. 1) Choose your noodles. I chose mung noodles because, although the word "mung" totally grosses me out, my friend Jess had shamed me for saying so and I felt guilty. I decided to give mung a chance. 2) Choose your protein. I chose tofu, obviously. 3) Choose your vegetables. I chose bean sprouts, shredded carrots, and scallions. They were all fresh and pho-nomenal tasting. 4) Pour in broth. I filled the rest of my container with the vegan broth. Andrew had pho for dinner, too, but he used beef instead of tofu, rice noodles instead of mung noodles, and beef broth instead of vegan broth. Now that I knew how to pronounce the word "pho," we spent most of our dinner coming up with dorky "pho" puns so I could use them in this post. As for the meal itself? It was pho-cking delicious. yeah is a little bit hard to find good ingredients in the your case, you know I'm not vegan but I love to eat vegan food, specially soy in great amounts.